This album spread includes two photos that capture two of the most important moments of the wedding ceremony at this Roma's Hospitality Centre wedding: that of the bride walking down the aisle accompanied by her parents and that of the first kiss that seals the union between a wife and her husband. 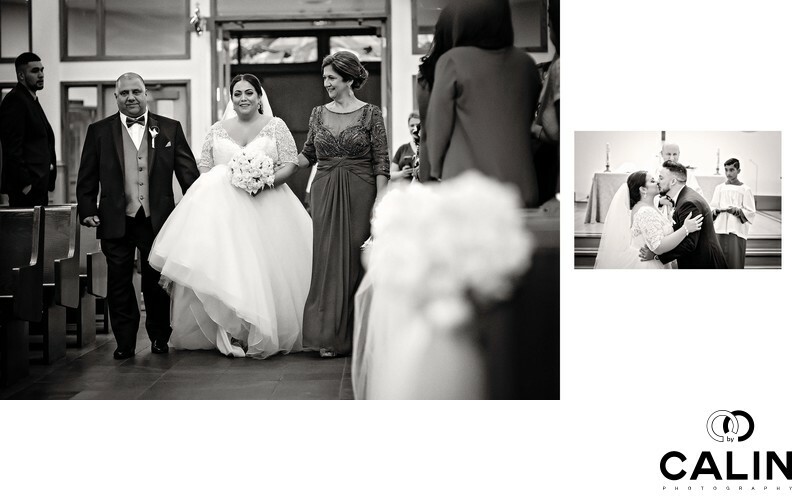 The image on the left shows the beautiful bride flanked by her father on the right and her mother on the left advancing down the aisle towards her husband to be. In this wedding picture we see a range of emotions from a slight sadness of the father whose losing her daughter, to the happiness of the daughter looking ahead towards a new life as a married woman. At the same time, the brides mother is looking towards her smiling. On the left and right of the trio, the guests are looking at them creating virtual leading lines the direct the viewers gazed towards the bride. The second image on the spread placed on the right has a smaller size and depicts the moment of the first kiss. Behind the couple kissing we can see the priest smiling at them while the altar boy on the right side of the frame is looking puzzled at the couple. To reflect the for journalistic nature of the wedding pictures I processed them in black and white and added a bit of grain to make them timeless. Too often I see wedding photographers following trends in shooting and processing. Unfortunately, 30 years down the road their images will look dated. My goal is to deliver my married couples classic artworks that will stand the test of time from opposing, lighting and processing standpoint.